Here's the perfect blog to read regularly if you want to practice your Spanish, learn commonly used colloquial phrases and practice writing in Spanish by leaving comments. 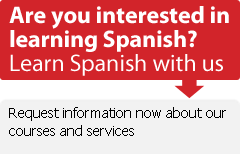 What's more, you will learn about Spanish culture, history and everyday life while you're at it. Best of all, it's a warm, funny, and thoroughly interesting read. A mis 95 años is the blog of María Amelia, who lives in a pueblo in Galicia. On her 95th birthday her grandson gave her a blog, and she's been diligently blogging ever since. She's talked about life in her pueblo and much of the history she's seen in Spain, including the civil war and the transition to democracy. María Amelia gets dozens of comments daily from all over the world, so you can feel comfortable leaving her a little note in less than perfect Spanish. "Amigos de Internet, hoy cumplo 95 años. Me llamo María Amelia y nací en Muxía (A Coruña) el 23 de Diciembre de 1911. Hoy es mi cumpleaños y mi nieto como es muy cutre me regaló un blog. Espero poder escribir mucho y contaros las vivencias de una señora de mi edad." UPDATE: María Amelia passed away on May 20th of 2009. She blogged for 880 days. Her grandson updates her blog in her memory.